Lemony herbs always seem like summer. Lemon basil, lemon balm, lemon grass, lemon verbena, citrusy geraniums and so on. I grow them in large pots in our courtyard where they escape the scorching sun and heat of the house garden and farm. Of the group, lemon verbena is the one that endures outside the season since I dry it for a digestive tea that we enjoy all year round. With local blueberry season winding down, I decided to capture a bit of summer in a berry jam infused with lemon fruit and the grassiness of lemon herbs. I typically make this jam with lemon basil but thought that the more robust verbena was worth trying. I also changed the method for making this jam from previous versions. In order to diminish the amount of sugar, I boiled the berries in a little water first and measured the result, adding sugar in proportion. Blueberry skins have a lot of natural pectin and lemon created an acidic condition so I didn’t see the need to over-do the sugar. Since this yielded a lot of liquid, I drained the juice and boiled it to the gel point before adding the fruit and cooking to gel again. Cook half of the blueberries in water until they burst. Add the remainder of the blueberries and cook until tender, a few minutes. Measure the blueberry mixture and add half of the volume of sugar (i.e., 4 c blueberry mix, 2 c sugar). Peel the lemon and finely dice or sliver half of it and add it to the blueberries. Juice the lemon, reserving the seeds and pulp. Add the juice to the blueberries, place the seeds and half of the lemon hull in a muslin sack and submerse it in the blueberries. 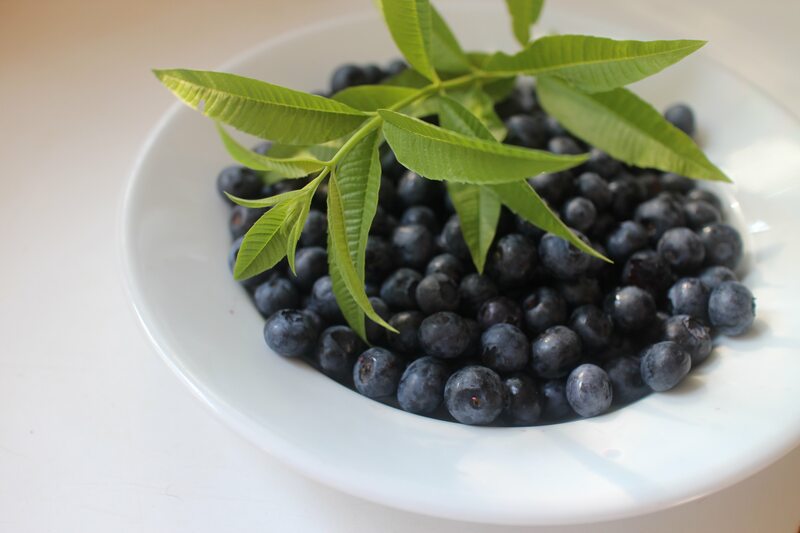 Lightly bruise the leaves and stalk of the lemon verbena and add it to blueberries. Let mixture sit for several hours on the counter or overnight, refrigerated. 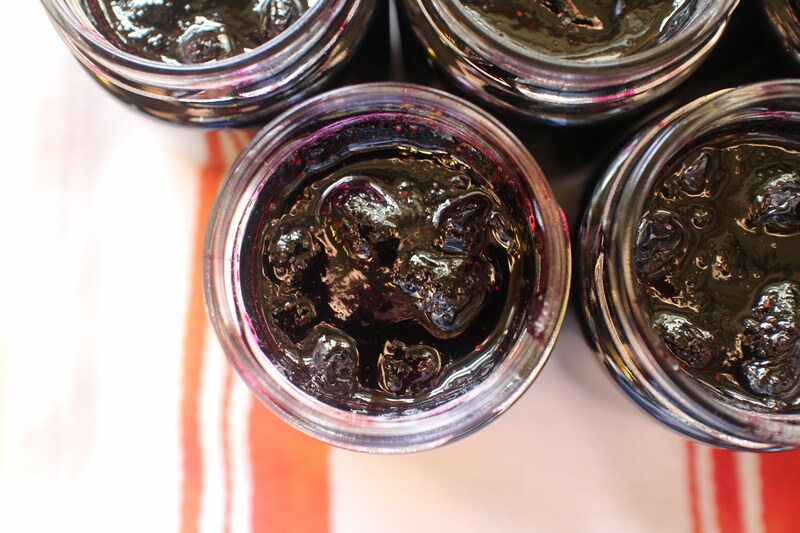 When ready to make jam, prepare jars for water bath canning and place a saucer in the freezer for testing the gel. Drain the liquid from the macerating berries into a heavy wide pan and bring to a boil. Boil until it tests for gel (a small drop on the frozen saucer will be wrinkly to the touch), 5-7 minutes. Add the berries and boil again until it tests for gel, about 5 minutes. Ladle into prepared jars and cap with a two-piece lid. Process the jars in boiling water for 10 minutes after the water boils. Turn off the heat, remove the lid and let sit for 5 minutes before removing to a counter to sit, undisturbed until cool. Makes about 6 four-ounce jars.